1.3.3 東海道新幹線の放送スクリプト: 平成初期にかけて　1989／1992 - dutcheez’s Fun with English! Ladies and gentlemen welcome to our Shinkansen. This is the Kodama superexpress bound for Shin Osaka. We will be stopping at all stations before reaching Shin Osaka terminal. All seats in cars number 7 through 10 are reserved. Cars 1 through 6, 11, and 12 are for passengers without seat reservations. Car number 8 is the Green Car for passengers who have paid the supplemental charge. The non-smoking cars are number 1, 2, and 10. There is also a non-smoking section in the Green Car. Buffet service is provided in car number 5. Telephone service is also available in car number 5. The conductor’s room is in car number 8. Thank you. Ladies and gentlemen. Welcome to our Shinkansen. 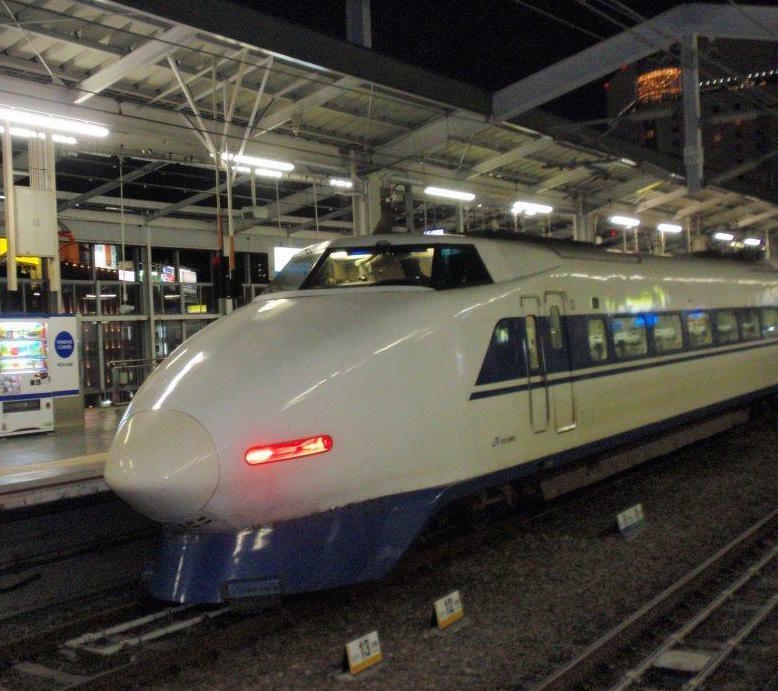 This is the Hikari superexpress bound for Shin Osaka. We will be stopping at Shin Yokohama, Nagoya, Maibara, and Kyoto stations before arriving at Shin Osaka terminal. All seats in cars number 6 through 16 are reserved. Cars number 1 through 5 are for passengers without seat reservations. Cars number 9, 10, and the upper level of car number 8 are the Green Cars, for passengers who have paid the supplemental charge. Private rooms are on the lower level of car number 9. The non-smoking cars are number 1, 2, 7, 8, and 12. The take-out cafeteria is located on the lower level of car number 8. Telephone service is available in every other car, but only a telephone card can be used. The conductor’s rooms are in cars number 7 and 10. Finally, we would like to ask you not to use portable telephones at your seats to avoid disturbing other passengers. Should you wish to use portable telephones, please do so in areas at either end of the cars. Thank you. Ladies and gentlemen, we will soon make a brief stop at Nagoya. Passengers going to the Tokaido, Chuo, Kansai, Meitetsu, and Kintetsu lines, please change trains here at Nagoya. Thank you. Ladies and gentlemen, we will arrive at Shin Osaka terminal in a few minutes. Passengers going to Osaka, Ashiya, Suita, Takatsuki, or subway line, please change trains here at Shin Osaka. Thank you.